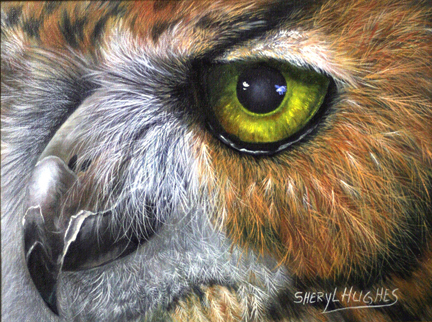 Art Gallery of Viera is proud to present Featured Artist for October, director of events, Sheryl Hughes. Sheryl Hughes was born in California and now lives in Florida. She is a multi award-winning artist and she has been taking photographs for many years and now uses those pictures as inspiration for her paintings. Sheryl spends hours in the wetlands, zoos and scuba diving where she photographs animals above and below water. She enjoys painting eyes as that is what brings the painting to life as you can look into the soul of the animals.